Donna Shirley was the manager of the Mars Exploration Program and the original leader of the team that built the Sojourner Rover. 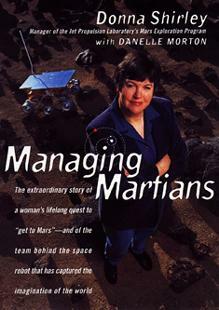 Donna, who retired from the Jet Propulsion Laboratory in August 1998, has written a new autobiography, published by Broadway Books in June 1998, called "Managing Martians: The Extraordinary Story of a Woman's Lifelong Quest to Get to Mars -- and of the Team Behind the Space Robot That Has Captured the Imagination of the World". It's the story of her life from her childhood in Wynnewood, Oklahoma to managing the Mars Exploration Program at the Jet Propulsion Laboratory. It chronicles the struggles and triumphs of the Pathfinder and Sojourner Rover teams which carried out the Mars landing on July 4, 1997, and tells of the ongoing saga of the Mars Global Surveyor currently orbiting and imaging the red planet. The story of the journey of a girl from a small town who becomes first a pilot, then an engineer, then a member and finally a leader of teams exploring the solar system will keep you turning pages. Look for it in bookstores or click on the Amazon.com logo below. Donna has also written an online book, "Managing Creativity: A Practical Guide to Inventing, Developing and Producing Innovative Products" In this book Donna shares her strategies for using the collective creativity of groups to develop ideas and efficiently and effectively turn them into real products. In covering such topics as, Using Creative Models, Building and Using Creative Teams, Creative Communication, Creative Planning, Creating Within Constraints, and Unleashing Your Own Creativity, Donna provides an invaluable tool for managers who want to get the most out of their teams. Managing Creativity: A Practical Guide to Inventing, Developing and Producing Innovative Products is available now as an electronic book. If you are interested in purchasing the entire e-book, please email Donna. .
*Please note: in order to read either of these you must have Adobe Acrobat Reader. If you do not have it, you may download it for free.